It’s been 4 months and 5 days. I think I’ve been in somewhat of a state of shock these last few months…and coming out of it ever so slightly this week. It’s another stormy evening here in the Carolinas…rain…thunder and lightning…general gloominess. Lately, there’s been a lot of suffering in this nation…hard to even comprehend what people must be going through. Sharon was well aware of all the troubles going on in the world. There was a phrase from the movie ‘Cold Mountain’ that she often invoked…”The Lord won’t let this stand much longer”. I hope that’s true…I’m praying that it’s true. Lord knows that I’ve lost all hope of even having a glimmer of understanding of what’s going on in this life. The closest thing to a ‘transcendental’ experience in my life occurred when I spent a year, a little over twenty years ago, driving a school bus in Prairie Grove, Illinois. My mother had recently been diagnosed as having terminal cancer, and I took some time off to help my dad care for her. The early morning and afternoon schedule of a bus driver helped me to take her in for her chemotherapy and radiation treatments during the middle of the day. Mom died in November, but I continued driving for the rest of the school year. On a fine Spring morning…with the dark Winter just a fading memory…after having picked up all 40 or so of my kids (including little George the troublemaker), I pulled up to the last stop sign before arriving at Prairie Grove Elementary School. Ahead of me was another yellow bus…driven by Laurie. We were both stopped beneath a huge oak tree…directionals flashing for a left turn…Laurie’s bus in front of me…covered with sun-dappled early morning shadows…the most peaceful scene one could imagine. Suddenly…there was an unearthly silence…usually, the kids were extremely noisy. I looked in the rear view mirror to see what was going on…all the kids looked forward in collective astonishment…and met my gaze…and then started laughing. What just happened here? I still don’t have a good explanation. The only thing that comes to mind is…the presence of God? I’m not sure that we’re even asking the right questions. Sometimes…I agree with Iris DeMent…that we should just…’Let the mystery be’…and maybe…put our entire trust in God…and let the chips fall where they may. Companion: one who accompanies another. One who shares a journey with another. Man is the mirror image of woman. One complements the other. Both, together, along with God, are co-creators of the universe. Sharing of this strange and wonderful life…is a heartfelt need. …the Rocky Shoals Spider Lily. 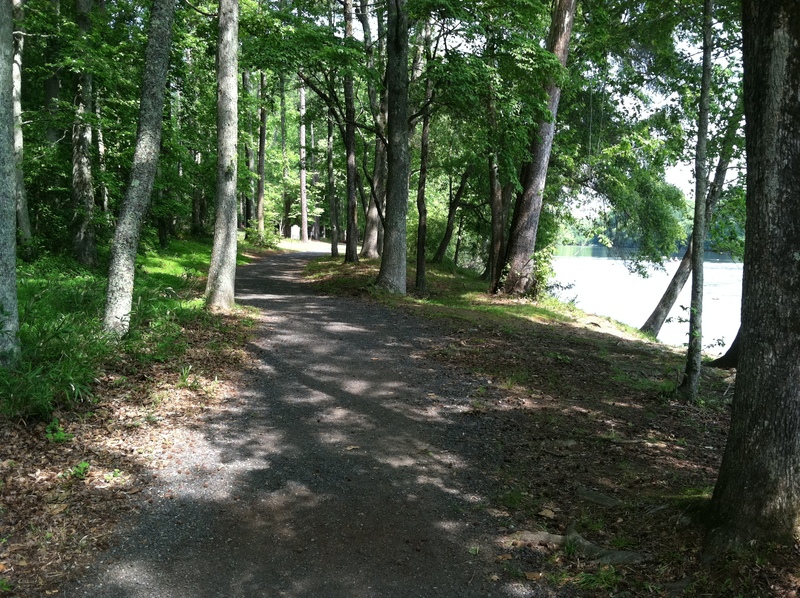 This morning held the promise of a beautiful spring day, and my mercurial mood-o-meter was spiking in the positive direction, so I decided to spend the morning at Landsford Canal State Park, which is only 4 miles due west of the house, as the crow flies, on the western banks of the Catawba River. Unfortunately, I live on the eastern side of the river, and it’s about a twenty mile trip over the nearest crossing. But, it was a very nice morning…and worth the drive…so I grabbed a couple of granola bars and a bottle of water, and hit the road again. The morning air at this time of year is heavily scented with the sweet smell of blooming shrubs and flowers…and the magnolias are in full display. 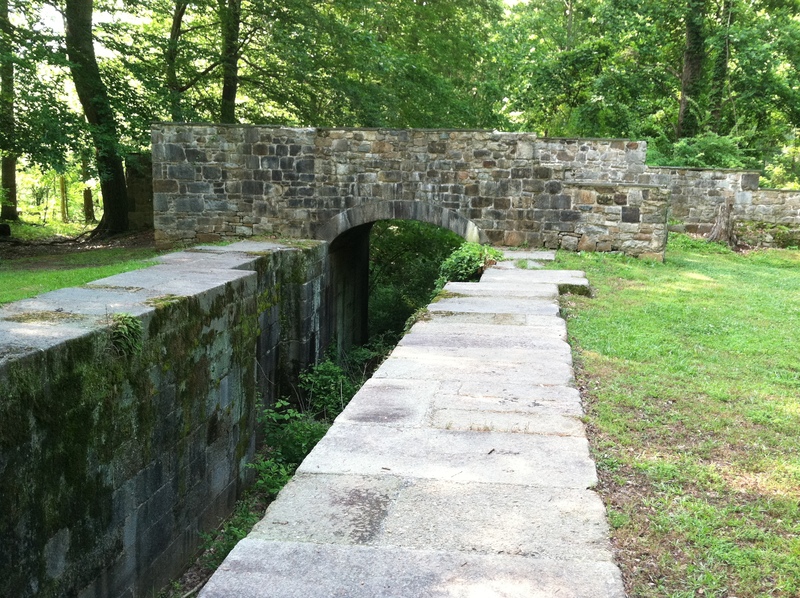 Landsford Canal State Park contains a series of locks that were in use during the early 1800s, to allow boats to navigate around the falls and shoals of the Catawba river in this area. The locks allowed the boats to overcome a 36-foot fall in elevation along the rapids of the river. This 200-year old structure is still quite impressive. The park is also said to contain the largest population in the country of the Rocky Shoals Spider Lily (Hymenocallis coronaria) . The lilies are usually in full bloom from mid-May through mid-June. After walking about a half-mile along a trail down river, I came to the spot where the lilies lived among the rocky shoals. Unfortunately, I was either too early, or too late, since there were no blooms to be seen. I did find a photo of the lilies in full bloom, and it’s quite impressive. I guess I’ll have to try again on another visit…perhaps on a moonlit night…to get the full effect. 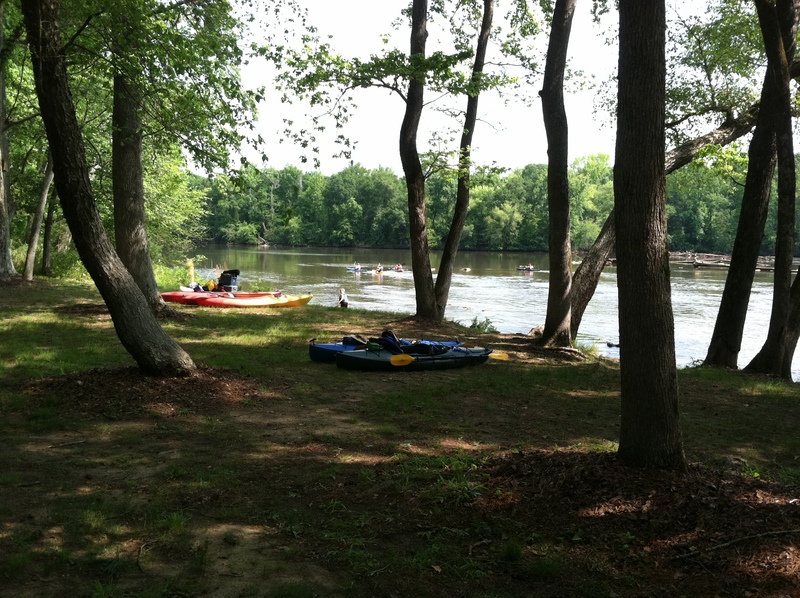 It brought back memories of the times Sharon and I went kayaking when we lived in Florida. I still remember the time we were on the Myakka River near Sarasota. There was a large population of alligators on the river, and we spent a few hours serenely paddling the river with gators lurking near the shore. About a week later, I read about a man, who was out kayaking by himself, being fatally attacked by a large bull alligator who evidently didn’t appreciate the kayaker encroaching on his territory. Thinking back on our little outing with the gators on the Myakka River, all that comes to mind is…”What were we thinking!” But…it’s a good memory…and I miss our little exploits on the water. There’s a lot of history in this little corner of the world called the Waxhaws. 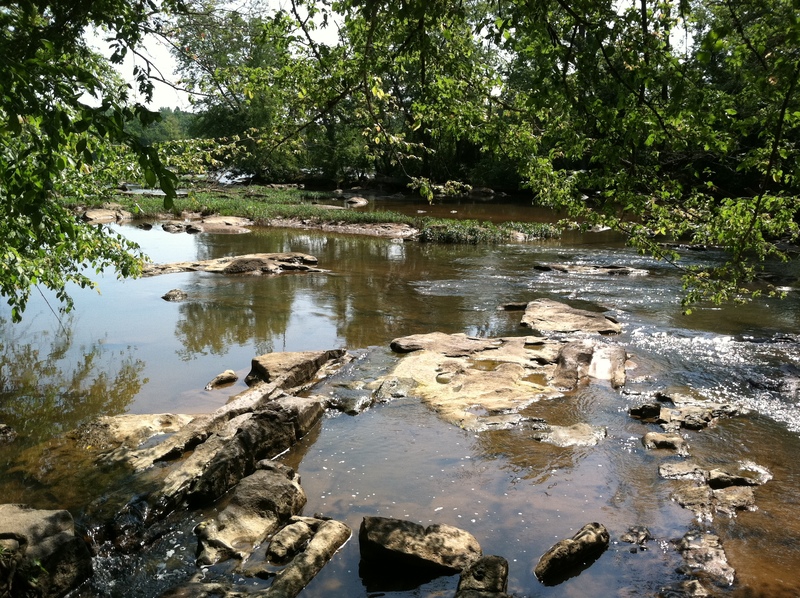 During the Revolutionary War, the British troops under Cornwallis crossed the Catawba at Landsford. In 1781, they burned down the old Waxhaw Presbyterian Church meeting house (Andrew Jackson was baptized here) that was only a mile and a half from where I live. 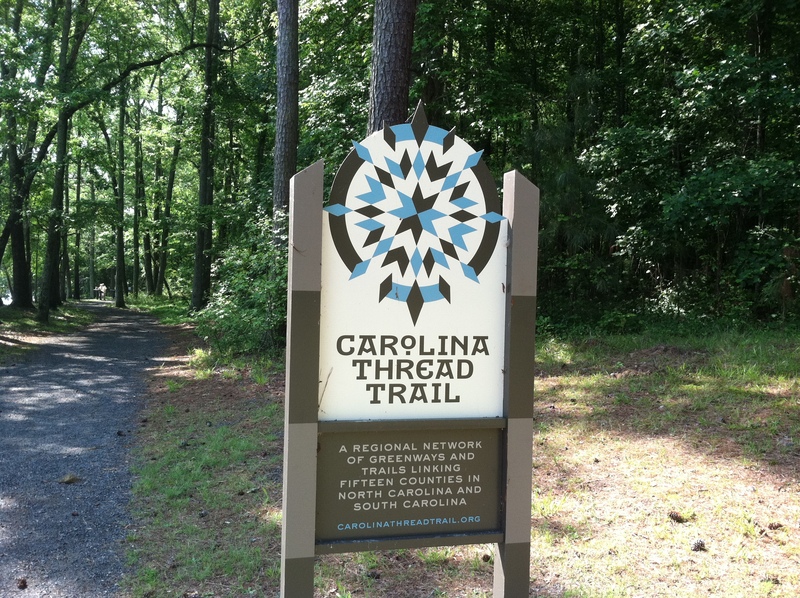 The trail at Landsford Canal State Park is part of the Carolina Thread Trail, a network of existing and proposed trails, greenways, and byways located in the heart of the Carolinas. Well…that was my Saturday morning diversion. And yes…I did remember to take the trash to the dump…and feed Hector (he can be so needy). I remember my first day at work after Sharon died. As my computer started up, the instant messenger program indicated that I had a new message. It was from Sharon, sent after I had left work the day before her last…”Are you still there?” I sat and stared at that echo for quite a while. A few weeks later, I received a phone call from the eye doctor’s office, confirming an appointment that apparently Sharon had made for me. And then there were the TV programs that she had scheduled to be recorded on the DVR. One day, the movie “Gladiator” (one that she knew was a favorite of mine) showed up on the list of recorded programs. So…I sat down and watched it again. The scene at the end when Maximus dies is, for me, very moving and beautiful…I have to fight back the tears every time I see it. I thanked her for this little ‘echo’ of thoughtfulness. In two days, it will be four months…and I miss her greatly. Today is our wedding anniversary. I can’t think of much to say tonight…only words I should have said…but didn’t say enough. Well…I’m down off the mountain, and back to the red clay soil and gently rolling hills of the South Carolina piedmont. It was a good trip, if only for a few days, and it helped to get my eyes on some new vistas. It was my first solo trip (for fun, anyways) in a great many years. My only companion this time was the disembodied voice (whom I’ve named Molly) that emanates from the GPS unit in the car. She keeps quiet for the most part, and speaks up only on occasion, when she feels it’s necessary to give me direction. The trip was amusing, humbling, informative, and at times quite magical. 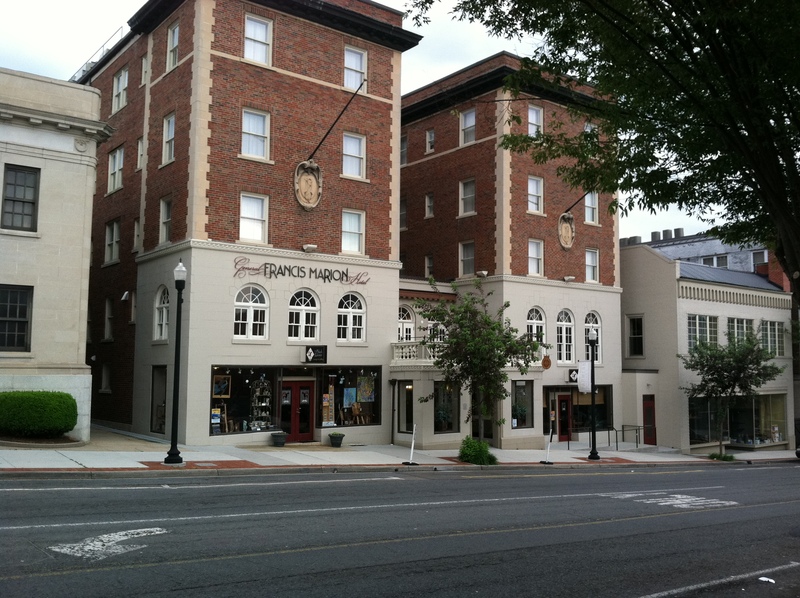 I stayed at the General Francis Marion Hotel for two nights. I was highly impressed with the quality of this little 36-room hotel located in the small town of Marion, Virginia. The hotel, built in 1926 (and at whose grand opening, the author Sherwood Anderson was in attendance), has been recently and obviously lovingly restored, with a lot of thought given to details. It’s truly a tiny five-star hotel that has been plopped down in the highlands of Southwest Virginia. It’s my new favorite (my old favorite…which I still hold in high esteem… was The Empress in Victoria, British Columbia, which I’ve only had the occasion to visit twice). OK…I gave Molly a new life and purpose…I only hope that her direction finding capabilities have improved. After leaving the park, I drove over to the historic town of Abingdon, Virginia, about thirty miles further west along the central valley of the Appalachians, which was a major corridor for early settlers who made their way through the mountains and beyond to the further hinterlands. When I arrived in Abingdon, it had started to rain, so I didn’t do much walking around. I instead popped into a local coffee house named Zazzy’z and grabbed a cup of coffee, and, since they had free Wi-Fi, did a little research on the rather depressing spectacle that I had witnessed along I-81. The damage that I had seen had indeed been caused by a horrific EF3 tornado (packing winds of up to 165 mph) that passed through Glade Spring in the early morning hours of April 28th. It was truly a humbling experience to happen upon that scene unexpectedly. 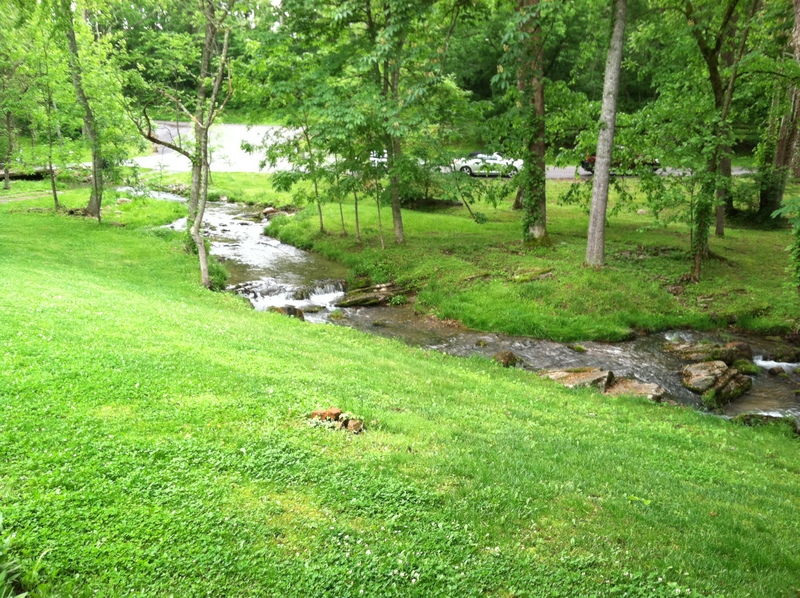 I then decided to drive up to the Abingdon Vineyards and Winery, nestled among the trees and hills of the South Holston River. I had noticed a sign for the vineyard along the highway (hey…I think half the fun of travelling is being spontaneous, and going with the flow). I found the address, and punched it into the GPS. Molly quickly responded with the shortest route, and I obediently followed her directions (Sharon never liked using the GPS, and didn’t much trust it. She had another name for Molly…and it started with a ‘B’. Sigh…I miss her). 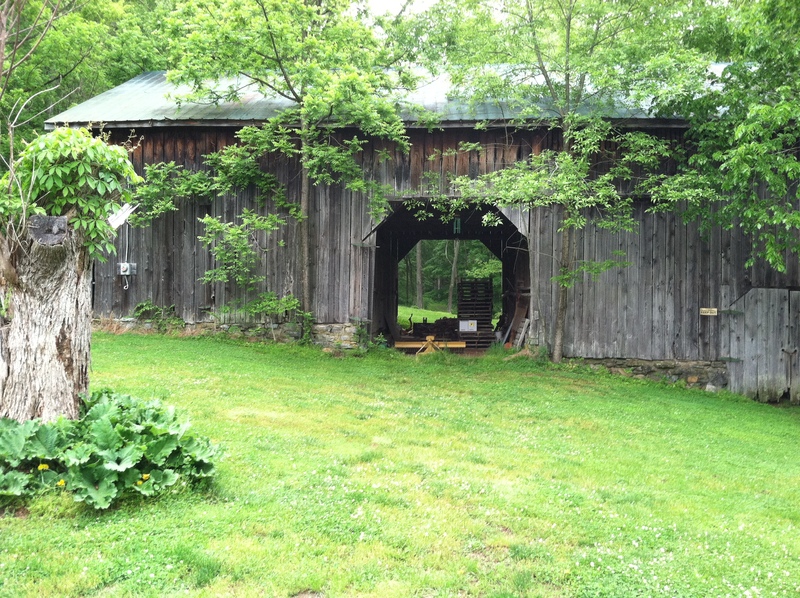 When we arrived (OMG…I just realized I used the word ‘we’…I’ve got to stop that), the place was beautiful, with a small babbling brook, and an ancient looking barn. As I pulled into the empty parking lot, the owner invited me into the tasting room to sample some of his wines. We had a nice chat. I mentioned that I had, surprisingly, seen quite a few signs along the highway, both in North Carolina and Virginia, for local vineyards and wineries. He told me that the tobacco farmers in the region were being encouraged to grow grapes instead of tobacco, and had been offered incentives by local governments to do so. So, it seems that this whole area was quickly becoming the new up and coming wine country of the Southeast. I drove back to Marion, looking forward to the highlight of my trip, and the main reason I came up to this area. 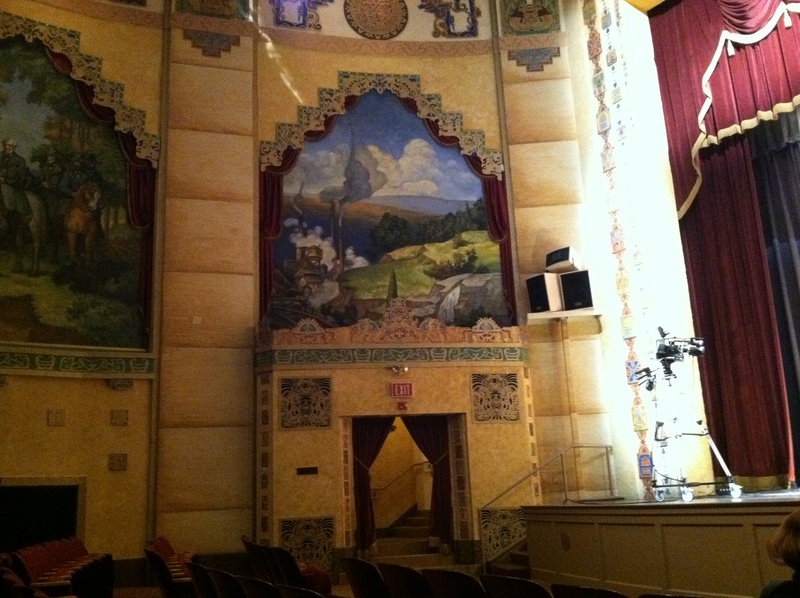 This evening, I would be attending a bluegrass concert at the historic Lincoln Theater in Marion (it seems that everything around these parts is prefixed with ‘historic’). 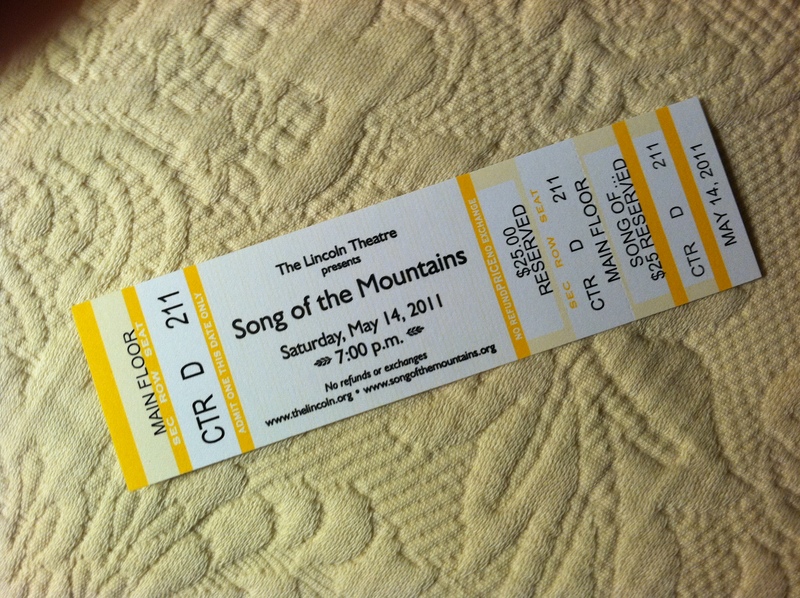 Since moving to the Carolinas, I’ve picked up the odd habit of watching a television program called ‘Song of the Mountains’, which is broadcast every Saturday night on the PBS station in Charlotte. It’s devoted to bluegrass music, a distinctive genre of music that originates from this part of the country. The region called Appalachia has enthralled me. Someone has said that it’s such a distinctive sub-culture of the American experience, that it really should be another country. I find the ‘otherness’ of this region so interesting that I’ve fallen in love with it. Just being there on a rainy night in Virginia, was magical…like experiencing the real thing after having seen it only in a dream. The music was great, and the concert lasted about three hours. I’m not one who is easily impressed by celebrity, but the sheer down-homeness of the host, Tim White, and everybody in attendance was refreshing. Now comes the hard part…to paraphrase the Italian poet Dante Alighieri (in the local dialect), “I woke up this Sunday of a mornin’ and found myself in a dark and misty woods.” Someone has said that one of the most consciousness-raising experiences that you can have (including those that are drug-induced) is that of growing older. Having just passed my 60th birthday without the woman I love, I think I’ve come to the realization that I’ll never really ‘get over’ her loss. A change of scenery won’t do it…and I don’t think that time will heal this wound. The pain will probably get a little duller over the years…but I don’t think it will ever go away. I checked out of the hotel early this morning. The sky was gray, and the misty clouds were covering the mountains, looking like rain at any moment. I had decided to drive back home over the mountains, instead of around them. As I got to the North Carolina border near the crest of these ancient mountains, the clouds began to part, and the early morning sunlight began to flood the hills around me…Appalachian Spring. Every shade of green you could imagine. It was like driving through a dream…sunlight and then shadows…sunlight and shadows…an overwhelming sense of peace and silence. They say that travel broadens the mind. I encountered something today, unexpectedly, that left a deep impression. I awoke early this morning, grabbed some coffee and a waffle down in the hotel restaurant, and then headed north a few miles to Hungry Mother State Park. 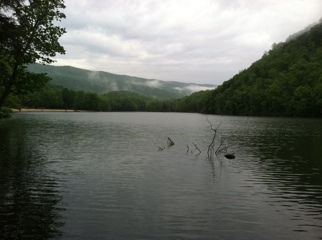 The sky was gray, with misty clouds shrouding the surrounding mountains. Afterwards, I had planned to drive west about thirty miles to the historic town of Abingdon. Midway along I-81, I saw something that took a while to register in my mind, as to what exactly lay on both sides of the highway. There was utter devastation of houses amidst piles of rubble, with columns of smoke rising from numerous places up into the leaden sky. Whole groves of trees were snapped in half, with many completely uprooted out of the ground. The scene before me went on for at least a mile. I was literally awestruck by the thought of the sheer power that had laid waste to this community. It finally dawned on me that this was the result of what could only have been a massive tornado. I’ve seen many reports on television of destruction from such storms, but none of them prepared me for the scope of what lay before my eyes. A picture just can’t convey the enormity of it all. I have a newfound respect for what tornadoes are capable of doing. My heart goes out to the people of Glade Springs, Virginia, who had to endure this on April 28th.